HARARE, Zimbabwe, Nov 17 2015 (IPS) - With droughts wreaking havoc in vast areas of Zimbabwe, a majority of people here are fast falling in line with climate-smart agriculture (CSA) as food deficits continue. CSA is the agricultural practice that reduces exposure, sensitivity or vulnerability to climate variability or change, which is a result of technologies that sustainably increase productivity and support farmers’ adaptation to climate change. According to Environment Africa, an African-rooted non-governmental organisation responding to the continent’s environmental and climatic needs, CSA is working to assist Zimbabwe’s struggling farmers. “Climate-smart agriculture is helping reduce greenhouse gas emissions while affording farmers to cope with changes in the climate and extreme weather events, leading to improved agricultural productivity, incomes and building resilience among resource-poor farmers,” Barnabas Mawire, the Environment Africa country director here, told IPS. Many remote farmers like Livias Gawure from Mwenezi district in Masvingo Province in Zimbabwe are living proof of the success of CSA. “Drought has become a thing of the past to me after I put into practice every aspect of climate-smart agriculture in order for me to prevail against climate change impacts here in the low veld where we have often had poor agricultural yields,” Gawure told IPS. “I have become a proud farmer of maize and sorghum including several other small grains crops, which I profitably sell every year despite this region being the dominant area of drought,” Gawure said. According to the United Nations’ Food and Agricultural Organisation, of Zimbabwe’s estimated 14 million people, more than 70 percent depend primarily on agriculture for their livelihoods but often face low productivity, thanks to the climate change impacts. “Zimbabweans are generally practicing CSA, one way or the other, knowingly or unknowingly. CSA is being promoted extensively in Zimbabwe, with conservation farming on the forefront. Other CSA practices that Zimbabweans are already engaging in include diversifying into drought-tolerant crop types like small grains and adopting early maturing crop varieties,” David Phiri, FAO Sub-Regional Coordinator for Southern Africa, told IPS. Some farmers like Gawure in Zimbabwe’s marginal agro-ecological regions have opted to reduce on crops and concentrate more on livestock production. Such Zimbabwean farmers have however not only diversified into livestock production, but they have also opted for drought-tolerant small livestock like goats and indigenous poultry. Of this country’s population, approximately 2 million face starvation this year, based on figures from the UN World Food Programme. But as food deficits rise, Climate-Smart Agriculture has apparently become a good alternative for many vulnerable Zimbabweans. “I should thank climate change lobby groups whose expertise in climate change matters helped us combat climate change impacts, and now through CSA, we are often on top of drought situations, save for a few people who have not put their faith in CSA,” Tambudzai Musina, a 68-year old widow in Mwenezi district, told IPS. Musina said many indigenous farmers like herself have been forced by climate change impacts to start embracing Climate-Smart Agriculture. “In order for us to overcome incessant food deficits, we have said yes to Climate-Smart Agriculture, and we are gradually winning against hunger,” she said. Eager to break free from hunger, many Zimbabwean farmers like Musina and Gawure also say they have gradually turned to water harvesting, terracing, mulching and growing drought-tolerant crops, which are also climate-smart as they battle to enhance their abilities to cope with weather extremes. “The climate-smart technologies practised in Zimbabwe are not entirely new to the farmers, but they are making more sense to them now than before due to climate change. As a result, the farmers are embracing climate-smart agriculture,” FAO’s Phiri said. FAO implemented a three-year EU-funded project in selected districts of Zimbabwe’s eight rural provinces. This project ran from 2010 to 2013 scaling up conservation agriculture by smallholder farmers. Hammered with starvation, Zimbabweans in their numbers have chosen to follow in the tracks of CSA. “Farmers who have adopted conservation agriculture (CA), for example have managed to achieve decent harvests, unlike those farmers not practicing CA. the same goes for those farmers growing drought-tolerant crop types and varieties. So in terms of household food security, those households adopting climate-smart technologies have managed to become food-secure,” said Phiri. “Yes, Zimbabweans understand that climate change is real and that their agricultural practices have to change and adopt conservation farming technologies to ensure food security at household level. The majority of resource-poor farmers who have hid the call have completely changed their farming practices and seem to be adapting to adverse impacts of climate change,” Mawire, Zimbabwe’s Environment Africa boss, told IPS. Many farmers like Gawure in Mwenezi district have gone an extra mile in practicing climate-smart agriculture. “I have constructed water pans to capture surface run-off whenever it rains and like many other farmers here I’m now able to keep farming through small scale irrigation for up to three months after the rains stop,” said Gawure. 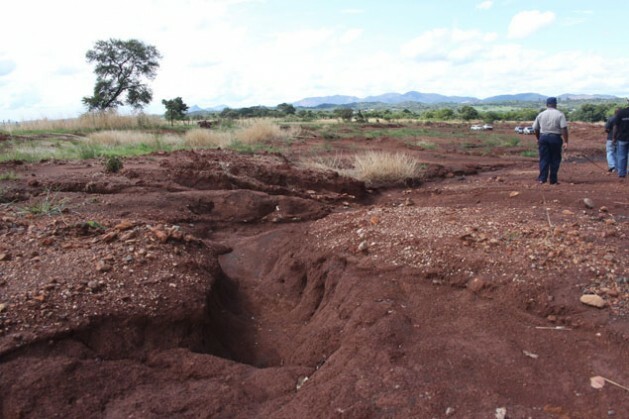 Another climate-smart practice that Zimbabweans have employed is agroforestry which entails the growing of trees together with crops such as drought-tolerant maize and sorghum to stabilize and enrich the soil. Things are improving at the domestic level as well. “There is increased food security at household level, land productivity capacity is being maintained and there is good recovery of degraded land,” said Mawire.